DeKalb Realtors » Get Involved! Get Rewarded! 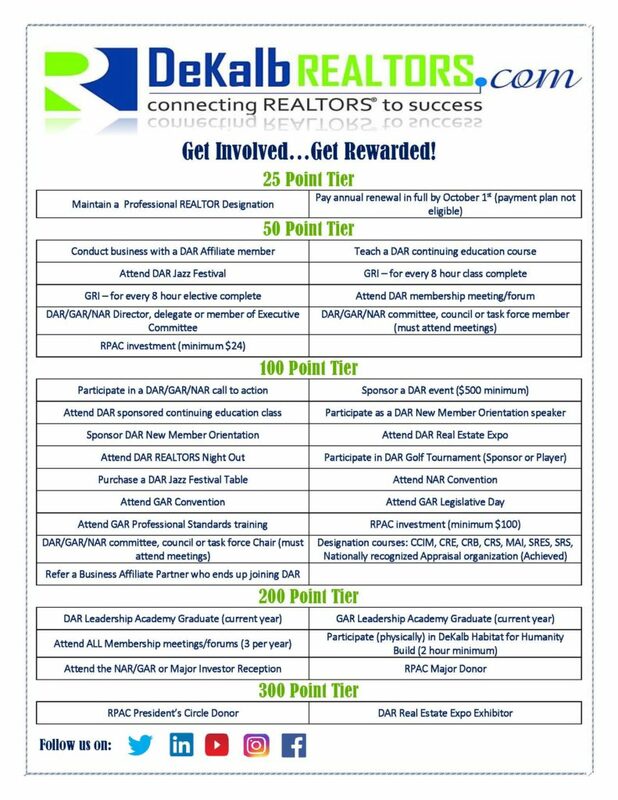 Get Involved…Get Rewarded Auction taking place at DeKalb REALTORS® on Thursday, November 15 from 6 pm until 9 pm!! Thank you for your continued membership with the DeKalb Association of REALTORS. We are excited to begin our new year and have some great news – introducing our new Get Involved…Get Rewarded program! This program allows you to accrue points throughout the 2018 fiscal year (October 1, 2017 – September 30, 2018), which can then be used to bid for items at our Points Reward Auction in November 2018. Gaining points is as easy as participating! Did you pay your 2018 renewal in full by October 1st? – 25 points! Did you participate in our DAR Golf Tournament? – 100 points! It’s that simple. Visit our website here to see a comprehensive list of how to earn points. Your points will be calculated the entire year by our online Monthly Point Sheets. You will need to fill these out monthly by the 10th of the following month (i.e. October’s point sheet must be completed by November 10th). Point sheets will not be accepted past the deadline, so please submit on time!